In a 2015 report, a team of scientist from the Weizmann Institute of Science provided compelling evidence that boosting the immune response in the brain (as opposed to suppressing it) might be a promising avenue for Alzheimer's research. In an extension of its initial findings, the team found that inhibiting an immune-checkpoint pathway which is targeted in the treatment of certain forms of cancer dramatically reduces Alzheimer's symptoms in a transgenic mouse model of Alzheimer's Disease (AD). The gradual loss of cognitive function characteristic of AD is associated with neuronal damage, amyloid-beta (Aβ) plaque deposition, and chronic inflammation within the brain. Over the past decade, studies have experimented with immunosuppressants to target the brain inflammation in AD; these studies have yielded inconsistent results, raising questions about the role of immune system activity in AD progression. In their recent Nature Medicine publication, scientists lead by Dr. Michal Schwartz looked at inhibition of the programmed death-1 (PD-1) pathway and the ensuing effects within a mouse model of late-stage AD. The PD-1 pathway establishes immune checkpoints that inhibit the immune system from attacking normal cells. Inhibition of this pathway effectively boosts the immune system, which forms the basis for the use of PD-1 inhibitors as a therapy for certain cancers that escape immune destruction. The team reported that administration of an anti-PD-1 antibody induced an interferon (IFN)-γ-dependent systemic immune response, followed by signaling in the brain's choroid plexus and macrophage infiltration into the brain. These effects were associated with dramatic reduction in amyloid plaque (Aβ) buildup in the brain, and significantly improved performance in a maze test of cognitive ability. Because PD-1 blockers are already on the market, testing the drug on human patients in clinical trials should be expedited; however, future studies in preclinical models are still needed to add support to these latest findings. Extending these studies by applying other cognitive tests following PD-1 inhibition could reinforce the potential of PD-1 checkpoint blockade as a novel AD therapy. Furthermore, there is no therapeutic effect of Aβ clearance in humans with late-stage AD, and self-assembled tau protein tangles also contribute to human AD. Thus, these finding need to be extended beyond Aβ by confirming the results in transgenic mouse models showing tau pathology. 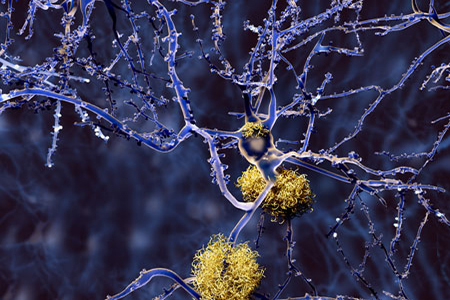 Taconic Biosciences' neuroscience portfolio of AD models offers variants of the widely-used APPSWE (a.k.a Tg2576 mice) Alzheimer's mouse model, including models with tau pathology. The APPSWE mice develop amyloid plaques with age, which is associated with neuronal decline and cognitive impairment. Variants of the APPSWE mice have been reported to manifest deficits in novel object recognition and diminished performance within the Morris water maze, radial arm maze, and radial arm water maze; making them a highly-desirable model for screening treatments that target cognitive impairments.